This auction is for a set of four 1GB DDR2 667Mhz ECC RAM models Part Number: MT18HTF12872AY-667D4 Pulled from a Dell Poweredge 840 Any questions please send me a message. 400 MHz PC2- 3200R-333. Model :HP Part# 373029-051. Fits : IBM, Dell, HP servers. This Item is second user and in good Condition. Chip Technology 4GB (4x 1GB modules). CAS Latency. 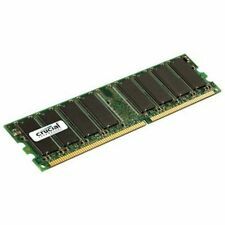 4 x Qimonda HYS72T128420HFN-3S-A 1GB PC2-5300F Fully Buff ECC Server Memory This RAM is for Servers Only. This will not work in a normal desktop pc! Items were removed from a working environment Item have been fully tested. You will receive 19 modules of various makes. Crucial 1GB DDR-400 UDIMM. Form Factor UDIMM. Series Crucial. Module Qty. ECC NON-ECC. But this is not our preferred option. Model Number: PC2-5300F-555-11. Model: PC2-5300F-555-11. 39x 1GB 2Rx8 PC2 5300F Various RAMS. 2x 2GB 2Rx4 PC2 5300F Various RAMS. To Hynix HYMP512R724-E3-AA, 1GB 1Rx4 PC2-3200R-333. 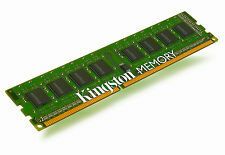 Type: DDR2, 400Mhz, ECC, REG. Speed: 400MHz ( PC2-3200). 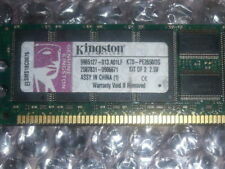 32GB (32x 1GB) DDR2 240-pin PC2-3200 400MHZ ECC Reg. Capacity:32GB ( 32x 1GB ). 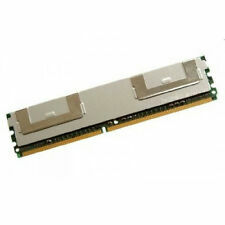 DDR2 PC2-3200R ECC REG 240pin. Ending Soon. New Arrivals. QUICK LINKS. PC Components. we do not take any responsibilty after this. Why Choose Us! Audio Visual. STORAGE CAPACITY: 1GB. NUMBER OF MODULES: 1 X 1GB. DATA INTEGRITY CHECK: ECC. - PROPRIETARY HP PROLIANT SERVER - DL585 G2. - PROPRIETARY HP PROLIANT SERVER - DL385 G2. - PROPRIETARY HP PROLIANT SERVER - BL465C. Condition: Used, Tested working. These were professionally pulled from working DELL,HP, IBM, and Blade Servers. Upgrade and Compatible for the following Servers & Workstations. DELL POWEREDGE SERVER - 1800. COMPAQ 1GB PC2700 DDR. We Accept Only. Ending Soon. New Arrivals. QUICK LINKS. we do not take any responsibilty after this. Refurbished . you can buy in set of 6 max. Generation PC3200. Information technology professionals rely on HP quality to ensure maximum productivity. Technology DDR SDRAM. Capacity of Module in Kit 2GB. Shape Systems Ltd was established way back in 1993 using our experience in the mini systems market. Hynix 4GB (4x1GB) HYMP512F72CP8D3-Y5 AC-C PC2-5300F-555-11. Capacity per Module: 1Gb. Total Capacity: 4GB. Ranking: Dual Rank 2Rx8. Form Factor: DIMM 240-pol. 4 x 1GB HP 398706-051 DDR2 PC2-5300F. ACS #0062 35XLOTS#C-13. In the unlikely event there is a problem with your item we are always happy to investigate and resolve issues. Bankers Draft. Credit or Debit Cards. Capacity 1GB. Type SDR SDRAM. Capacity per Module 1GB. Country/Region of Manufacture Puerto Rico. UPC Does not apply. Number of Modules 1. MPN A6098-69101. Item Specifications. Job Lot 33 X 1GB (33GB)DDR2 & 3 Laptop memory Samsung Kinhston Hynix Nanya Micro. Condition is Used. Dispatched with Royal Mail 1st Class Large Letter. Bus Speed PC2100 (DDR-266). Form Factor DIMM. Capacity per Module 1GB. HP A8800 1GB SDRAM. We Accept Only. Ending Soon. New Arrivals. QUICK LINKS. we do not take any responsibilty after this. you can buy in set of 6 max. Why Choose Us! Fujitsu 1GB DDR2-800 PC2-6400 ECC RG 240-Pin Server RAM. Capacity: 1GB: 1 x 1GB. Equivalent Part Number OEM Manufacturer: Fujitsu Technology Solutions S26361-F3372-L413. Technology: DDR2 SDRAM. Data Integrity Check: ECC Chipkill. Bus Speed PC133. Capacity 1GB. Type SDR SDRAM. Capacity per Module 1GB. Country/Region of Manufacture Puerto Rico. UPC Does not apply. MPN A6115-60002. LOT OF FOUR (4). Country Area of QLD/SA/NSW and Tasmania. ABN# 55 119 790 108. /Canberra/. Manufacturer Third Party. Helpful Links.